The incredible fruits on this mature specimen have grown to an enormous size and ripened up well in the Mediterranean house this year. This isn’t a lemon for your gin and tonic, though, it would be more suitable for your mincemeat as the fruit is a major source of candied peel. Citrus medica originates from North India, reputedly cultivated and spread to the Mediterranean by Alexander the Great, it is an ancient hybrid (4000 years old) that comes true from seed but takes many years to reach maturity and produce fruit. 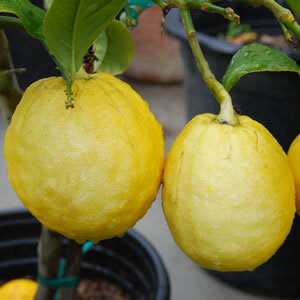 Citrus medica are greedy plants that need regularly feeding to flower and fruit well. Make sure you come back in the summer to appreciate the wonderful scent from the flowers too!